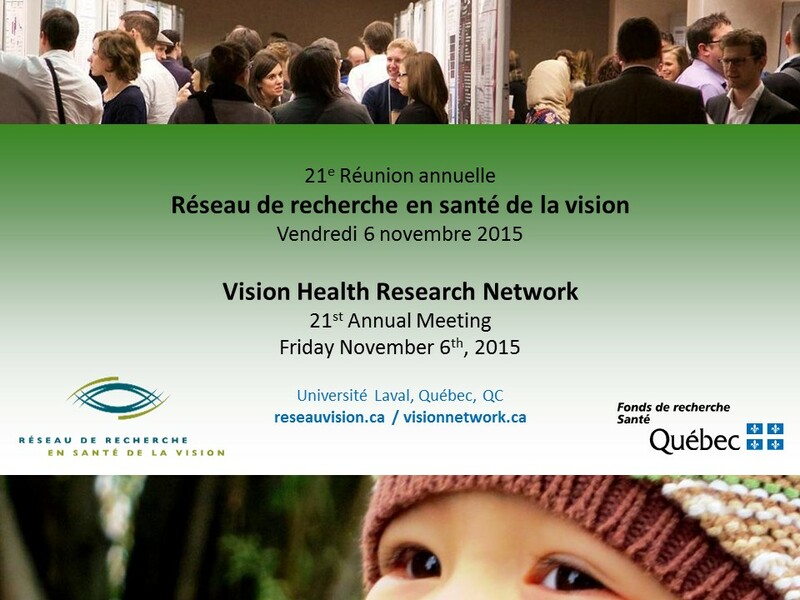 The 21st VHRN Annual Meeting was held on Friday November 6th at the Université Laval in Quebec City. The event gathered 220 students, researchers, clinicians and other professionals involved in vision health research. Two guest speakers presented their research and cutting edge accomplishments: Drs Jeffrey L. Goldberg et Margareta Claesson (biographies below). The program included 37 oral presentations, 70 posters and 9 workshops and special interest groups. Congratulations to all the presenters for their excellent work! The keynote speaker of the plenary session was Dr Jeffrey Goldberg. He is Professor and Chair of Ophthalmology at Byers Eye Institute at Stanford University. His clinical effort is focused on patients in need of medical or surgical intervention for glaucoma and other retinal and optic nerve diseases, as well as cataract. His research is directed at neuroprotection and regeneration of retinal ganglion cells and other retinal neurons, and his laboratory is developing novel stem cell and nanotherapeutics approaches for ocular repair. Heed Foundation. He was named the 2010 Scientist of the Year by the Hope For Vision foundation, and received the Cogan award from the Association for Research in Vision and Ophthalmology in 2012. He was elected in 2010 to the American Society of Clinical Investigation, an honorary society of physician scientists. He directs an NIH funded laboratory and oversees research in the Department of Ophthalmology at University of California, San Diego. His goal is to translate scientific discoveries to patient application. He has already developed significant experience with implementing clinical trials, having successfully cleared two Investigational New Drug through the FDA for Phase I trials for optic nerve neuroprotection and regeneration. His presentation reviewed recent technological progress applied to optic nerve regeneration relevant to glaucoma and other optic neuropathies, and of cell therapy relevant to endothelial cornea diseases. The guest speaker of the Cornea and anterior segment axis was Dre Margareta Claesson. Dre Claesson is an ophthalmic surgeon at Sahlgrenska University Hospital since 1979 and a Senior Consultant since 1996. Her main interest is corneal disease and corneal surgery. She is the Medical director of the Cornea Clinic as well as the Medical director of the Sahlgrenska Hospital Eye Bank. She is responsible for the Swedish Cornea Register which she started in 1996 and she is Chair of the Swedish Cornea Surgeon Society, which she also started in 1994. Dr Margareta Claesson completed her Medical School and PhD studies at the Faculty of Medicine of the Gothenburg University, Gothenburg, Sweden. Her research interests are corneal transplantation outcome and factors that influence graft survival and visual outcome. She received the serving Sister of the Order of St John, for work done at the St-John Eye Hospital in Jerusalem. Her presentation reviewed the development and the use of a Cornea Transplant Registry for clinical and research purposes.